was very active for the 60th Anniversary of the Berlin Airlift in 2008. I am really interested to work with you together. I am the German representative of the Cold War Museum Berlin Chapter. Best to you and a Happy New Year. and FSBVG is proud to accept their endorsement. We thank them for their service. The 6941st Guard Battalion was a predominantly German security force assigned the mission of providing security to U.S. installations in West Berlin, including at Teufelsberg. They were garrisoned at Roosevelt Barracks in Berlin. At the beginning of January, the FSB Veterans Group issued a call to all veterans of the former Allied Forces to save Field Station Berlin (Teufelsberg). We are wholeheartedly behind this action. Please visit the FSBVG website. The page featured an aerial photo of T-Berg. This British counterpart of the 6941st Guard Battalion, above, has posted a message of support for the campaign to Save Teufelsberg! on its home page. http://www.248gsu.de has a link to the WAiB webSite, and a link to the ePetition. Support the campaign to SAVE TEUFELSBERG! Now on sale are campaign logo tee-shirts in several styles, all sizes, colors, and sleeve lengths, plus canvas bags. BerlinBrigade.com has given FSBVG permission to display the banner from their site to show their support for the Save Teufelsberg! campaign. Listen to the interview. Also, there you will find another opportunity to make comments to blogs. Stop by and say "Save Teufelsberg!" Thanks for your support, BerlinBrigade.com ! Twenty years of failed plans to convert Teufelsberg to another purpose --- Now it's time to give the ideas of those who served on Teufelsberg to protect Berlin a chance to do something positive with Teufelsberg. Teufelsberg today is a weather-beaten, forlorn, empty shell, with a tattered "Keep Out" sign flapping on a weed entangled pole, a poster child for what could have been, but never was. These shabby ruins mostly just need new glass, paint, minor repairs, and furnishings to be used as a memorial to the Cold War, and as a museum: a symbol of courage and determination to survive! Thanks for visiting our SAVE TEUFELSBERG! News page. Return soon to see late breaking news. The author of "Voices Under Berlin", T.H.E. Hill, has endorsed the Save Teufelsberg! campaign. He has given permission to display the banner from the book's website to demonstrate his support. As a former member of the British Guard Unit 248th German Security Unit, 2nd Royal Military Police Regiment, I am pleased to support this action. There are so many monuments in Berlin, but symbols like Teufelsberg should not be allowed to disappear. A lot has already been lost, and our task is to save what is left, so that the generations that follow us can have their symbols saved as well. With the help of the Monument Protection Office, the three chimneys of the Reuter Power Station were the first to obtain favor. They were a sign of the determination to see things through during the Blockade. Without Reuter, Berlin would have been forced to capitulate. 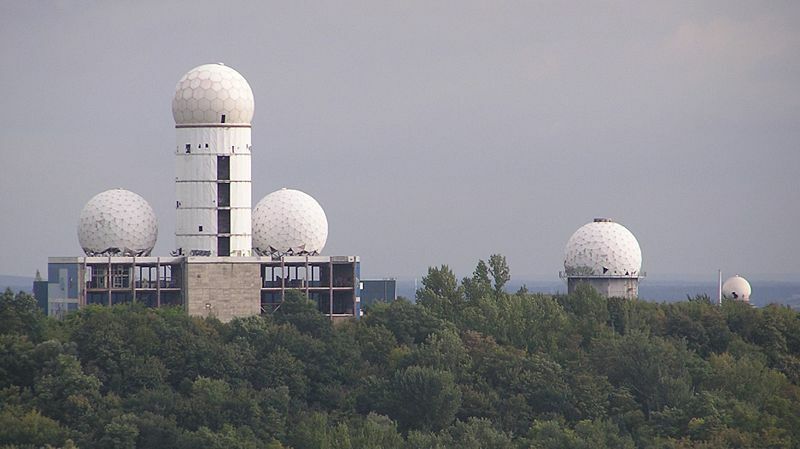 Without Teufelsberg and its antennas, and Tempelhof and its radar, the West would not have know what the East was up to. They were the guarantee of our freedom! That is why I support this project! This action is intended to demonstrate our thanks for the years of continuing friendship with the Allies in West Berlin. The presence of the Allies in Berlin contributed significantly to the ability of West Berlin to exist in peace and freedom. It is only right that we should create a monument that reflects the almost fifty years that the Western Allies were on duty in Berlin. It is not just the Soviet occupiers who need monuments like Treptow or 17 June Straße in Tiergarten, but also those who stood should-to-shoulder with us in the West during times like the Berlin Blockade and the construction of the Wall. And so we call on EVERYONE to support the petition of the Field Station Berlin Veterans Group (FSBVG) and of the Association of the Western Allies in Berlin (WAiB) by signing this petition right now, here on-line. on January 24, 2009, Robert Wilde, an About.com Guide to European History since 2001, reported on the FSBVG Campaign to Save Tuefelsberg! He encouraged his readers to participate. Wilde says, "It may seem too soon to start talking about museums and monuments to the Cold War, as it often feels [like] only yesterday that the conflict ended. . .
Post your own comment while you are at this history blog. Thank you for informing us. Sent info of site to my congressman here in Minnesota. Here in the US we are too much of a throw away society, but when things get known, there is always a chance someone steps up to the plate, a save can be had. Here's hoping a piece of history can be saved for the living & the future. At a press conference in November 2007, Emanuel Schiffgens, David Lynch's partner for establishing a so-called "invincible university" to teach the philosophy of transcendental meditation atop Teufelsberg put his foot squarely in his mouth when he said: "We want an invincible Germany!" a statement that in German has overtones of Hitler's thousand-year Reich. "What do you mean by this concept of invincibility," asked an onlooker from the audience, made up mainly of film students with a smattering of meditation devotees. "An invincible Germany is a Germany that's invincible," replied a Delphic Schiffgens, who was dressed in a long white robe and gold crown. "Adolf Hitler wanted that too!," shouted out one man. "Yes," countered Schiffgens. "But unfortunately he didn't succeed." At that the crowd began shouting epithets at the speaker: "You are a charlatan! This is bad theater!" By Andrew Purvis/Berlin, posted Thursday, Nov. 15, 2007. In the German language article by Von Brigitte Schmiemann, Baustadtrat Klaus-Dieter Gröhler (CDU) commented on a proposal by the "Maharishi-Weltfriedensstiftung" (Maharishi World Peace Foundation) to build a center on Teufelsberg, saying that the area is zoned as forest. "And there is not even the hint of a necessity to grant a construction permit for such a facility." The article is accompanied by a recent, small, aerial photo of the Field Station buildings on Teufelsberg. The mindless vandalism that the little photo reveals is shocking. It is worth following the link below to the article just to see the photo. An article by Brigitte Schmiemann in the Berliner Morgenpost (16 April 2008) details the situation surrounding Teufelsberg. In 1996, the Teufelsberg Investors Consortium (Investorengemeinschaft Teufelsberg [IGTB]) bought the hill from the city of Berlin for 2.65 million Euro. Plans called for apartments, a restaurant, a hotel and a "spy museum." The expected completion date was 2001, but in 2004, when no obvious progress had been made, the Berlin Senator for City Planning, Ingeborg Junge-Reyer (SPD), broke the contract with IGTB, and rezoned Teufelsberg as forest. 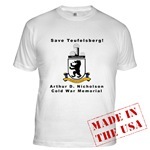 In late 2007, IGTB sold Teufelsberg to the Maharishi World Peace Foundation. IGTB, however, is in an uncomfortable position, because the agreement with the Foundation was conditional on the Foundation obtaining a construction permit. But as the Planning Commissioner for Charlottenburg-Wilmersdorf, Klaus-Dieter Gröhler (CDU), has said, here and in other articles, Teufelsberg is zoned forest and no construction permit will be issued. IGTB wants to reach an agreement with the city that will allow some development of Teufelsberg. The original grand scope of IGTB's plans have been reduced to a museum and a small-scale restaurant in the middle of the woods. IGTB has said that it will be guided by the plans for the re-use of Teufelsberg by the architects Bettina Franke und Simon Micha Karsunke, which won the Peter-Joseph-Lenné-Preis des Landes Berlin in 2007. Their plans called for a restaurant and museum in the Field Station buildings, and for using the FSB tower as a panoramic viewing platform. According to their plan, the surrounding undeveloped meadows would be arranged to offer an unrestricted view of the city. The article is accompanied by an aerial photo of T-Berg showing immense damage by vandals. Viewing the picture is worth following the link even if you can't read the article in German. Write Senator Ingeborg Junge-Reyer (SPD), and let her know that you want to Save Teufelsberg! Klaus-Dieter Gröhler (CDU), says that there is no construction permit for this property, and that this will not change. The property is zoned as forest. This contact information has been added to the lists on the Save Teufelsberg! page. Right on! The radar facility is a part of Berlin's history and has to be preserved for future generations! We Berliners have absolutely no need for Yoga sects, and there are a lot of uses for the buildings! It's tragic the way things look there now! I fully support the Field Station Berlin Vets! Exactly. I also support preserving this facility. It is almost completely preserved, in contrast to the many other reminders of the time of the Wall! Simply come take a look around http://fsbvg.homestead.com/save_teufelsberg.html and sign the petition! The link to click to post says "oder selber einen Kommentar verfassen". (Or publish a comment yourself) You will need to enter a security code to post. The "send" button says "Sichern". The Siedlerverein ("Neighborhood Association") Eichkamp has put up a special page for the SAVE TEUFELSBERG! Campaign. Eichkamp is a neighborhood just northwest of Teufelsberg. On this map, below, T-Berg is the letter 'A' and Eichkamp is "B". "The veterans of the former Field Station Teufelsberg have begun a big campaign to preserve the intercept station on Teufelsberg. It should be protected from further deterioration and kept as a Cold War Monument. You can see how grass-roots campaigns are run in America Here . "Contact your elected representatives, write to Angela Merkel." There is an electronic Petition, and, naturally, matching campaign T-Berg shirts. There are also references to our site on the Eichkamp news page about Teufelsberg, and people are being encouraged to post comments. Eichkamp says, "Hats off to so much power!" Because the Eichkampers liked the T-Berg logo and the idea of matching campaign T-shirts so much, our artist made a special edition Eichkamp Rettet den Teufelsberg! (Save Teufelsberg!) T-shirt for them. You can see it on CafePress at http://www.cafepress.com/Eichkamp. Introduction: The government of the State (Land) of Berlin is made up of the Abgeordnetenhaus (Legislature) and the Senate (Executive Branch). Part of the political process in Berlin includes the formal submission of written questions by the Abgeordnetenhaus to the Senate. In 2008, the FDP shadow minister for Urban Development in the Abgeordnetenhaus, Albert Weingartner, submitted a series of questions to the Senate on Teufelsberg. Below is the FSBVG translation of the Senate's official response. "Is Teufelsberg a 'Devilish' project?" 1. What is the Senate's assessment of the structural soundness of the former Allied Intercept Facility on Teufelsberg? 2. What possibilities does the Senate see from improving the present situation, and how does the Senate intend to put them into practice? 3. Which structures are in need of urgent structural security? What steps will the Senate take to implement them? The Senate in principle shares the assessment of an unsatisfactory situation on the southern plateau of Teufelsberg that underlies the questions. The situation cannot, however, be influenced by the Senate because the property is privately owned. Because the property is fenced in and guarded, independent of the structural condition of the facility, no immediate danger to the public can be assumed. 4. Is it foreseeable during this session of the Senate that the State of Berlin will obtain ownership of the property? a) if yes, what steps and financial resources will be necessary, and how long with the transfer take? b) if no, for what reason is this not foreseeable? The Senate's idea is that the property be returned to nature and integrated into the surrounding Grunewald. To this end an offer to purchase the property was made to the owner in 2005, but it was not accepted. 5. Is the Senate aware that target practice with firearms is being carried out in the basement of the unsecured building? a) if yes, which official authorized them? b) if no, what measures have been taken to ensure the safety of life and limb on the property? b) The property is completely fenced in and is patrolled by the police as a part of their daily duties. 6. Are the present owners of the property known, and does the administration have a valid address for them? The Berlin Senate is moving at a snail's pace, hoping that the problem will go away, if they ignore it long enough, the Teufelsberg buildings will just collapse. The Shadow Minister, however, is trying to shake up the Senators from their lethargy, and we must thank him for that! The eMail for his department is: poststelle at seninnsport.berlin.de but we recommend paper letters as more effective than eMail in this case. Wouldn't you love to be able to sit in a snack bar (the old mess hall) on top of the hill and have a curry wurst? Be sure to put that in your letters. Both of these gentlemen speak English, and have English-speaking staffers. It's a question of numbers. The more letters, the more attention we get. In its local news column for 24 March 2009, Oliver Ohmann reports on the damage done to the antenna tower at T-berg, attributing the damage to "Rowdies", in a short article entitled "The Devil to pay on 'Devil's Mountain" (Teufelsberg = Devil's Mountain). The article notes that even though the property is surrounded by a chain-link fence, the trouble makers keep cutting holes in the fence and entering the property, stealing scrap metal and wrecking the facility. Warning signs have been posted, but they are being ignored. The article cautions readers of a real danger to life and limb. "Because the property is fenced in and guarded, independent of the structural condition of the facility, no immediate danger to the public can be assumed. . . . The property is completely fenced in and is patrolled by the police as a part of their daily duties." The Berlin Senate needs to urgently reassess the security situation on the southern plateau of Teufelsberg, and implement measures to protect the "public" from this "attractive nuisance", and to prevent the facility from further deteriorating while its fate is being decided. The Senate's failure to act would seem to indicate that it had decided on a policy of "demolition by neglect." reports on the destruction of the outer skin of the central antenna tower at Teufelsberg. The damage was caused by the wind. The chain-link fence around the property has been cut-through with bolt-cutters in more than a few places, says Baustadtrat Klaus-Dieter Gröhler (CDU), the director of planning for the Charlottenberg-Wilmersdorf District where Tuefelsberg is located. The article recaps the history of the controversy surrounding the lack of action with the property, pointing to the open legal issues of private property versus the state's ability to act. No action is possible until they are resolved. The article includes a mention of FSBVG's Save Teufelsberg! campaign, WAiB's support of it, and the ePetition to Save Teufelsberg! When asked about the campaign, Helmut Trotnow, the director of The Allied Museum in the old Outpost Theater said that he saw little chance for its success. "It started years too late," said Trotnow. The Berlin Senate and the Charlottenberg-Wilmersdorf City Hall should be proactive and insist that the owner implement a level of security that will keep out vandals and potential victims of the accidents that are waiting there to happen before someone gets killed. If the owner cannot provide that kind of protection, then the city should arrange for it and send the owner the bill. The address for the Allied Museum is on the front page. Write to Dr. Trotnow and let him know that you think that it is not too late to SAVE TEUFELSBERG! I was on Teufelsberg, and I was astounded by the vandalism. Not to mention the destruction! It is all very sad. I would love to take a bat to that bunch of rabble and give beat 'em black and blue, but at 70 there's not much chance of that. Kind regards. "Hauptstadt Blog: Wir Bloggen Berlin"
Please leave a comment when you visit the Hauptstadt (Capital) blog site. We should preserve Teufelsberg as a monument to the Cold War. This piece of architecture, more than all the others, tells the story of the Allies who stood shoulder-to-shoulder with us, fighting to keep Berlin free. In my opinion, putting up a monument to our friends, the Allies in Berlin, is the least that we can do to say "Thank you" for almost 50 years of freedom. The intercept station on top of Teufelsberg is a part of Berlin's history of the Cold War, and must be preserved. It has become a Berlin landmark and is a part of Teufelsberg. A petition has been started for this purpose [see the link on the main page]. There are more than enough things that the facility could be reused for. Berlin has to be more protective of its history! Berlin should not destroy its history because it costs too much! It should be worth the money it costs to preserve the radar station to show respect for what the Allies did for Berlin. Planting three trees is not always the solution. A little more imagination should be applied to the situation. Melvin Heward has a pro-Save Teufelsberg! post in his blog "City Of Berlin Weekly." His post includes a short history of T-Berg and tells his readers where to go to help Save Teufelsberg! Heward lives in Berlin with his German wife. His profile photo shows him in Army uniform with Specialist Fourth Class insignia of rank. You have to be registered to post comments to his blog. In its "Experience Berlin" column, the newspaper lists what Burkhard Kieker, the head of Berlin Tourismus Marketing GmbH, considers three must-see Berlin spots. Number 1 on the Berlin Tourism list of the Best in Berlin is Teufelsberg, with its view to the horizons of Berlin. Kieker says that the view is "A perspective of the city that one seldom gets." FSBVG agrees with his assessment, and that is another one of the reasons that we want to Save Teufelsberg! It's not just for us, but for the Berliners as well. Bild.de lists "The real 'High Points' in Berlin"
Bild includes Teufelsberg in a April 2009 feature about the best points to view the City of Berlin. Bild's appraisal of Teufelsberg starts, "Want to escape the hectic pace of big city life, get out of the hustle and bustle? Then Teufelsberg is the right place for you. The thickly wooded rubble hill is a real oasis, and at 114 meters high, it is the highest "Berg" (Mountain) in Berlin. From the top you get a great view of Berlin from the west. Where? On the Teufelschuassee, between S-Bahn Grunewald and Heerstrasse." It's with great sadness that we have to report that our much-loved and long-serving chairman of the Field Station Berlin Vets group has passed away after a very long illness. David R. Wallace of Martinez, Georgia, was long disabled with multiple schlerosis, and was finally taken from us after a long battle with cancer. Dave was a six-year veteran of the United States Army Security Agency in Berlin, Germany, and many other stations around the world. He is survived by his wife Jean, and by a son who lives in Alaska. FSBVG officer Bruce Ford will serve as Chairman in his place. is presenting an architectural seminar (SS099) during their summer session 2009 using the Field Station Facility as the design project for the course. The seminar will develop a design for a viewing tower with a visitors' center and cafeteria covering approximately 500 square meters. The course blog has a bibliography and a You-Tube video from German TV on exploring Teufelsberg looking for tunnels. There is an interview with Stephen Bowman, Colonel, US Army, retired, who was the last US officer to have jurisdiction over Teufelsberg, and who continued as a Department of the Army civilian agent to look after Teufelsberg by guiding people to the hill and on it. Even thought the text is in German, it is worth watching. The Bibliography does not mention FSBVG's Save Teufelsberg campaign, but it does have a link to the petition to Save Teufelsberg. April, 2009: The United States Army awarded its Freedom Team Salute Certificate of Appreciation" to FSBVG Chairman Bruce Ford for service as a US Army veteran. This is in recognition of efforts in reuniting veterans of FSB, honoring Field Station Berlin service, and specifically for the campaign to Save Teufelsberg. with our Army and for your continued support of our Soldiers." Both the letter and the award were signed by the Secretary of the Army Pete Geren and the Army Chief of Staff General George W. Casey, Junior, both appointed in 2007 by President George W. Bush, and still serving under President Obama. FSBVG considers this as official recognition for FSB veterans working together to honor our military service, and Department of the Army approval of the campaign to Save Teufelsberg.